Mmmh, I guess I should have been reading that since I posted in this thread just a few posts after the one you link to but I don't think I did. Not an ideal workaround as it puts you in insert mode . Very minor issue for me anyway. So yeah it only affects ME and 98SE2ME systems then. Thanks for the head up. I've got exactly the same message - simply, I've unpacked installer with 7zip, and then I've put all files to the Opera directory. @ slhk: are you sure your problem is Opera 11 related? I mean, could be the same with previous releases. 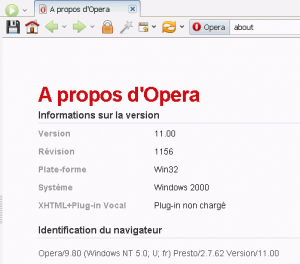 Opera had always some difficulties with non-latine characters AFAIK, especially on old OS. Maybe, you could check or ask on their Chinese forum or the General forum. @ loblo: Yes, I use Win98SE, and don't have this cursor bug. @ Dave-H: do you have any problem to save a picture or a webpage, or to log on this forum with Opera 11, like me? For me it doesn't crash, it used to with the previous KernelEx build but since xeno fixed the issue it's OK here. Just I need to append the file extension each time by hand in the filename field of the save dialog box otherwise the file gets saved without extension. I was still downgraded with KernelEx 4.5 RC4 due to my print problem (and I didn't wanted to stay with the fix provided by Tihiy because only 2 Dll was upgraded, and I didn't knew if it was intended for test-only or stable enough). Folk, every single problem is gone! and this post is sent from Opera 11! 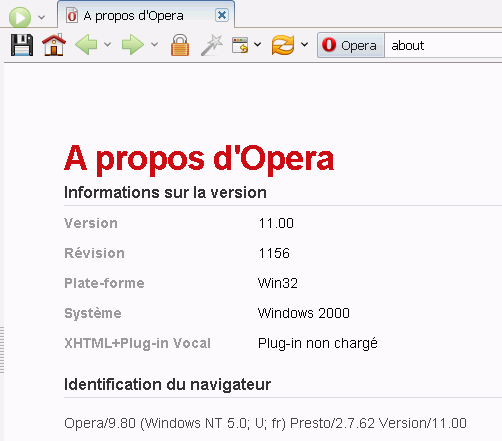 Every Opera "special" page is correctly displayed: about, config, cache, history, plugins! It's not only the "About Opera" page that doesn't render properly, it's also the plugins and cache pages. Strangely, the plugins page (only) seems to appear correctly the first time it's accessed in a session, but fails on subsequent views. The others are displayed incorrectly all the time. the pages are always displayed nicely now! Thanks Charles, all now working fine! The only thing I've noticed, and I spotted it doing a download, is that the speed readout on the downloads page seems to now be in Japanese instead of English! Not a big deal, but can anyone else confirm that? That's right! I don't have Japanese but squares, and nothing for the size of files. The sizes of downloaded files and download progress aren't displayed correctly. When I unlock it, the size settle down but the tab stay in first (that is doesn't go back to his original place). Thanks CharlesF, I have installed that on top of RC5 and all good and jolly so far. I confirm that all Opera cosmetic glitches are gone. And file extensions now get automatically appended but this doesn't work 100% correctly like it does for Opera 10.63 as far as the save html /mht/txt file dialog goes at least. Let me explain: If when I open the dialog it is set for saving as mht and I want to save as text by choosing text file in the drop down menu I'll need to change the extension by hand from .mht to .txt in the file path field otherwise the file gets saved as text but with an .mht extension . With Opera 10.63 the file gets saves as text with a correct .txt extension even though it is not reflected in the file path field. But this has become a very minor issue since I nearly always save as mht and very rarely toggle between one filetype to another when saving web pages. I also can confirm that the speed in the download page appear in japanese characters. I have a similar issue with the latest version of ZDoom which displays a log in a window on starting and this is in japanese or perhaps chinese character when KernelEx is enabled on it. If I disable KernelEx then no log gets visibly displayed unlike with older versions of ZDoom which display the log correctly in english regardless if KernelEx is enabled or not. I can confirm that but perhaps this could be a feature of the pin tab function??? or not? Lol! That must be a feature, I have the same behavior with XP Professional . Anyway, it's not Windows 98 or KernelEx related! So, it might be similar with the anormal characters bug in the download page. EDIT: Here we are: [bUG] Opera 11 pinned tab look fat tab. Just for information, there is no problem with the downloads page display running under Windows XP on my system, so it is a Win98/KEx compatibility problem, not an Opera problem.